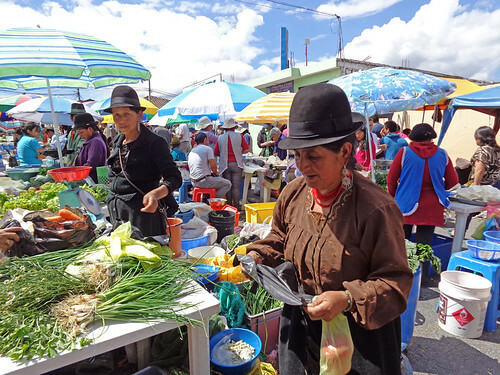 South of Quito are three of the most popular places where ex-pats, mostly from the US and Canada come to live, or to escape snowy winters (or as where we hale from in Vancouver BC, to escape the chilly winter rains) – Cuenco (Quen-ko) Loja (Loha) and Vilcabamba (Beel-ka-bamba). 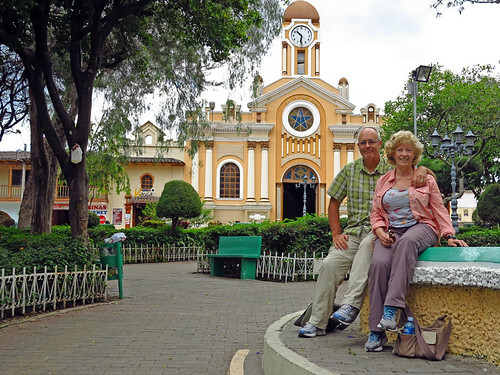 We decide to check out Loja and Vilcabamba, the two locales furthest south with lower elevations, to glean what the appeal is (besides the year round spring-like climate). But before I continue…here are some generalities about Ecuador whether to live/winter/travel in. The country currency is the American dollar, familiar to many around the world, including us Canadians, and the dollar goes a long way. It is known to be a safe country. You’ll need to know some Spanish as English is not widely spoken – learning on the go or lessons are available. On our 30-minute taxi ride from the Loja airport, we are treated to the area’s spectacular scenery – surrounding forested hills that morph into browns and further peaks that appear in muted blues under a canopy of white clouds and azure skies. 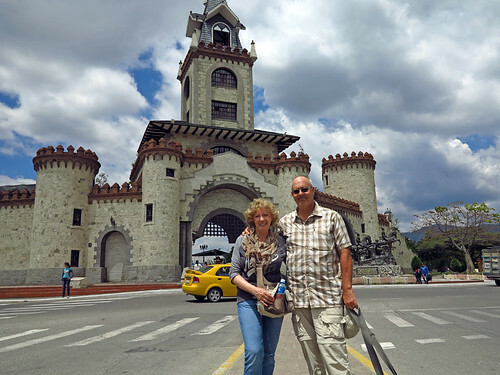 The highway is sided by adobe buildings with a rather industrial look, until we enter the gates of the old city, an archway in a large castle-like stone wall, with turrets, where a vibrant city of 250,000 is ours to explore. After settling in to the modern Zamorano Real Hotel, it is off to visit several squares. We join locals sitting on benches under shade trees and admire each square’s colonial church inside and out. 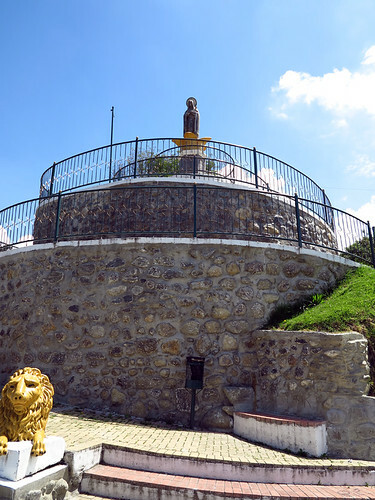 Like Quito, this city has a statue of the Virgin hovering over it from atop a hill. Another day we climb to her base for a panoramic view of the city. On our daily wanderings we stop for lunch at small restaurants, all serving $3.00 specials; which includes a bowl of delicious soup, entrée, and fresh squeezed fruit juice. We usually choose pollo (chicken) or pascada (fish) for our main course – words we recognize with the waiter’s rapid rambling in Spanish. It is even more of a surprise that our supper entrees at a white tablecloth restaurant are under $10 – got to love that elastic dollar! Sunday is Grande Market Day. Beginning at San Sebastian Square and for several blocks all the way up the hill are umbrellas and 4-post canopies. We are hyped! Vendors line the sides of the street, with another row down the centre, selling (I’d wager) every vegetable and fruit known to man. We walk by mountains of vine-ripened tomatoes, piles of potatoes, heaps of pineapple, loads of cabbage, and herbs galore. Most are familiar, but some items are strange indeed. One fellow with a poster around his neck showing various body organs is promoting blackish stems about an inch-in-diameter that are piled at his feet – “respiratory” and “stomach” are words I’m able to discern. Shoppers fill huge plastic shopping bags or pull-along totes with their week’s supply of produce choices for between $5 and $10 (according to a lady who spoke English). Other vendors are snack stops for the jostling crowds. Pork rind sizzles on grills, whole “guy” (guinea pigs) roast on charcoal grills, a nun stirs a vat of rica crema (rich looking custard), pancakes, soups…something to satisfy every craving. I load up on a dozen small juicy limes (which we have taken to squeezing into our water bottles), and a half dozen rosy-red apples – all for $1.00. Across from our hotel we are drawn like magnets to The Canadian House Center, where English is taught in day and night classes. We meet briefly with David and talk at length to the owner Diego, a native of Ecuador who has also lived for years in Canada. It is our opportunity to glean some of the particulars re: costs of living in Loja. Rents for apartments range from $300 to $500 per month. A house will be around $700. Averages for utilities for a month: Electricity $20, Cable TV $20, $25 high-speed internet, $20 water (if an older unit stove and hot water is most likely propane). A fair wage for a maid is $318 a month. From additional interviews with several Canadians who rent for the winter months, they indicate first timers usually start out in a hotel and look at places to rent while in the city, while others who are regulars here during the winter have “ins” with local landlords. We also go out with real estate agents to get the skinny on prices. Spacious apartments in a newly developed hillside with a great view of the city sell for $95,000. On the backside of the hill cattle graze in rustic surrounds. In the opposite end of the city we go to see apartments selling for $49,500 for a one bedroom, and $89,000 and up for 3 and 4 bedrooms with 3 baths. One bright sunny morning feels perfect to hop a bus for the 45km (25mi) trip to Vilcabama (cost $1.30 + 10cents to go through a turnstile to the bus platforms). The trip takes about an 1 ½ hours along a winding highway through villages, forests, and grasslands with a panoramic view as the road crests each hill, with the eternal backdrop of mountains. 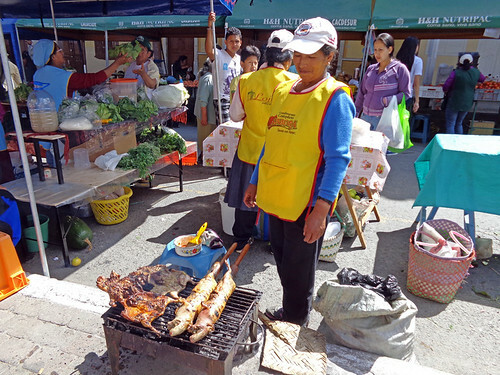 The long entrance to Vilcabamba (population 2,000) is filled with businesses such as auto-repair shops and shanty-type dwellings, but the heart of the village around a central park is “mucho” touristy – plenty of good restaurants, quaint cafes, small shops to purchase food items, clothes and hand-crafted souvenirs. English is more widely spoken in this village by establishment staff, and clusters of North American folk in both the “retired here” and “wintering here” categories, fill the central area chatting in groups over lunch, coffee or a few cervasa (beer). We also note some hippy-type young folks who have come to hang out in this wonderful laid-back setting. 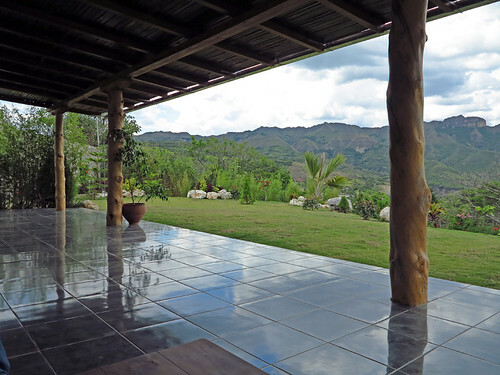 All the folks we speak to, including Marco, of a local real estate company, who was born and raised in Vilcabamba, concur the popularity of Vilcabama with foreigners has driven up rental prices for apartments and houses, and for sure property values. Large spacious homes rent for $600 a month and up, and houses to purchase range from $180,000 to $300,000. The grand house we go to see on the outskirts of town had an asking price of $285,000. Others rent in town for $300 (small 1 bedroom apartment with bath). Vilcabamba is known as the “Valley of Longevity” with many centenarians and reports of even longer life-spans. Past studies have claimed rich anti-oxidants in the mostly organic fruit and veggies – which makes sense when combined with the hard work and low-calorie/low-animal fat diet of locals keeping them healthy and vigorous into old age, which is changing with the more easy access to processed foods. 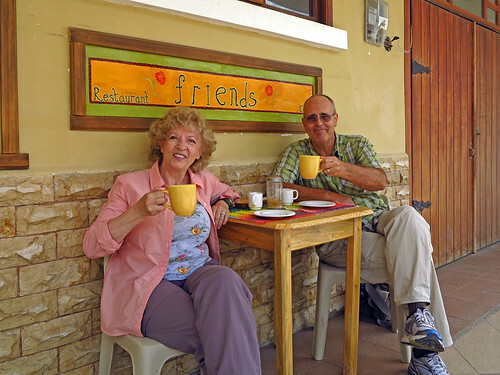 Most foreigners who rent or live permanently in Vilcabamba say how handy Loja is for all the conveniences and foods they are used to from home. As we sit around the fountain in the main square the peace and tranquility, fresh clean air, glorious 29degree Celsius sunshine are overpowering. After another walk around the village, now boasting two street-lights, which are hardly necessary, and its back to Loja by taxi ($10 including tip, and only 40 minutes). If you decide to check-out Loja or Vilcabamba be fair-warned of the stirring compulsion to purchase a home on the spot and never leave. We recommend spending a winter or two in the area, just as it is good to have a long engagement before marriage – to be sure your new love fits. 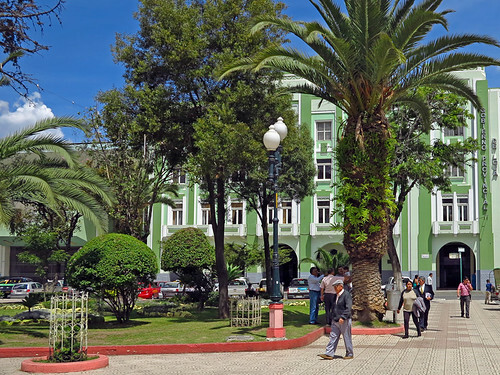 We certainly enjoyed our brief experiences in these smaller Ecuador locales – and can see these communities as an option for a reprieve from cold winter climates, or wanting to be immersed in a welcoming and friendly culture. 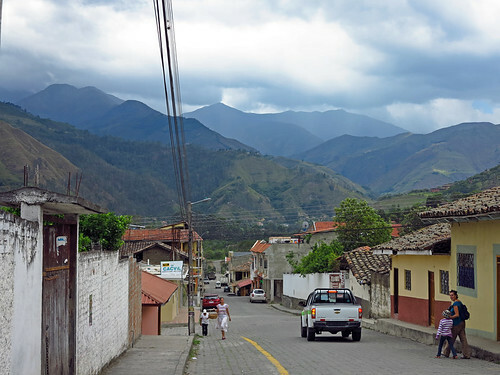 By the way, the small village of Malacatos, just before Vilcabamba when coming from Loja, is just now drawing interested gringos – hence this is reflected in lower rents and home prices! We return to Quito, where after a few days – it is off to the Amazon Basin for us! Love the article. When was it that you visited? My family and I are planning a relocation to Ecuador……but just need to pin a place down. We are deciding between a few options. Was the Canadian English School busy, did you happen to notice how many teachers they had? Please let us know where you end up settling in Ecuador. Hello! I live near Loja and really enjoyed your article. You gave some really accurate, useful information. I’ve been asked to write a couple of “postcards” for International Living. I was wondering if I could get permission to use two of your pictures of Parque Central (the one with the green gobierno building behind it, and the one facing Simon Bolivar with the red building beyond the park) as well as the one of Calle Lordes. I would be happy to give due attribution if you would feel comfortable letting me use these photos.